Toyota Research Institute to open autonomous testing facility in U.S.
An aerial shot of the MITRP facility in Ottawa Lake, Michigan. The Toyota Research Institute plans to open a closed-course testing facility for autonomous vehicles at the Michigan Technical Resource Park in Ottawa Lake, Michigan. The site, to open in October, will be used to reproduce scenarios that are too risky to execute on public roads, TRI said in a statement, and will involve "congested urban environments, slick surfaces and a four-lane divided highway with high-speed entrance and exit ramps." Ottawa Lake is near the Michigan-Ohio border, 35 miles south of the Toyota Technical Center operations outside Ann Arbor. A TRI spokesman declined to comment on the details of the agreement with the resource park, including the cost of the arrangement and the length of the lease. 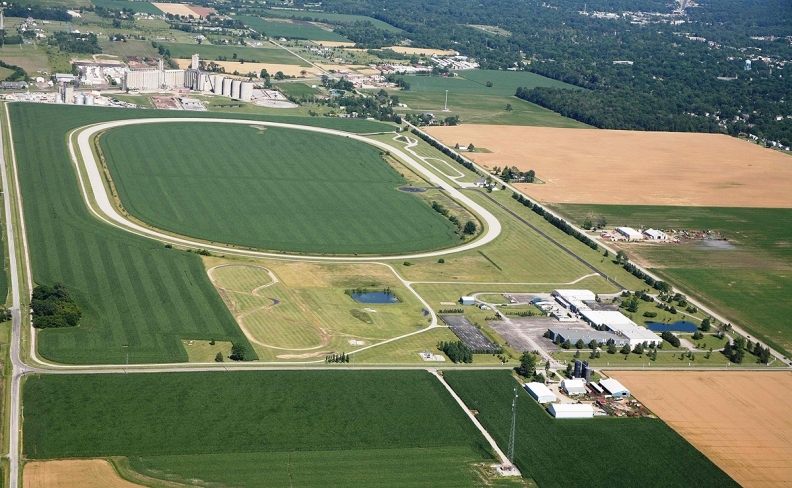 TRI plans to lease the track, and the land in the inner ring, from the Michigan Technical Resource Park, or MITRP. The 50-year-old track had been used for decades by auto supplier Dana, which is based several miles away near Toledo. FCA US currently uses the site for vehicle storage, with thousands of mostly Ram trucks and Jeep SUVs parked along the track. "By constructing a course for ourselves, we can design it around our unique testing needs and rapidly advance capabilities, especially with Toyota Guardian automated vehicle mode," Ryan Eustice, TRI senior vice president of automated driving, said in a statement. "This new site will give us the flexibility to customize driving scenarios that will push the limits of our technology and move us closer to conceiving a human-driven vehicle that is incapable of causing a crash." Larry Vellequette contributed to this report.